This large altarpiece is a fine example of the Valencian school during the International Gothic Style in the first quarter of the 15th century. It was traditionally attributed to the German painter established in Valencia, Andrès Marçal de Sas (ca.1393-1410) although this attribution is still subject to debate and leads to more cautiously call the artist responsible for this work 'Master of the Centenar' according to the provenance of the retable most likely executed for the chapel of the Confraternity of the Centenar de la Ploma. The altarpiece illustrates the legend of the St George, a Christian warrior saint, said to have lived at the end of the 3rd century. It is composed of 3 superimposed central panels surmounted by the Holy Spirit and Christ enthroned flanked by two prophets. On each side are depicted 10 scenes of the life of the saint, combining two different narrative cycles: the victory of St George against the dragon and the martyrdom of the saint while the predella panel illustrates 10 scenes of the passion of Christ. 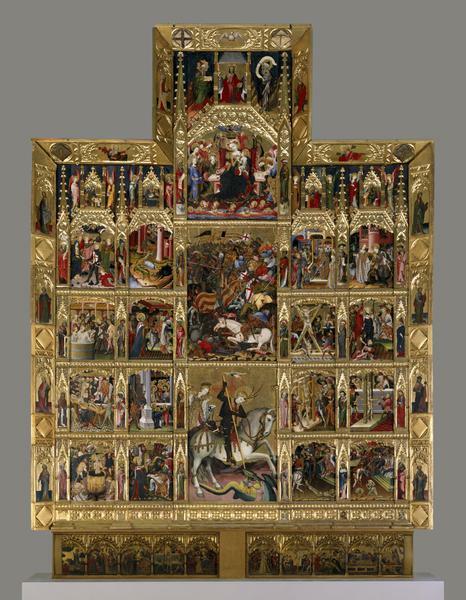 Large altarpiece composed of 20 panels representing scenes from the legend of St George with a predella illustrating 10 scenes from the Passion of Christ; on the upper register is represented the Christian hierarchy with Christ, the Virgin and Child, prophets and apostles while the all composition is subdivided by full-length figures of saints and prophets. Historical significance: This altarpiece is traditionally attributed to the German artist established in Valencia, Spain, Andrès Marçal de Sas (ca.1393-1410) (Post, 1930) even though this attribution is not entirely convincing as it mainly relies on a consistent feature of the retable, the prominent long nose seen by various scholars as the hall-mark of Marçal de Sas (on the ground of a comparison with a fragment of the Incredulity of St Thomas, Valencia Cathedral Museum, the only surviving work of the eight listed under his name). Despite an obvious unity of style, it has been considered as the work of several hands: Pedro Nicolau, the main associate of Marçal de Sas, Gonzalo Perez and Miguel Alcaniz have all been suggested as collaborators in this work. Recent studies have more cautiously proposed to identify the artist responsible for the execution of the altarpiece as the Master of the Centenar (Heriard Dubreuil, 1987). This name was forged on the provenance of the work which was probably destined to the Confraternity of the Valencian civic militia dedicated to St George and called in fact the 'Centenar de la Ploma'. The company was originally founded as a company of hundred ('centenar') archers in 1365. Their insignia, a crossbow, stands alongside the cross of St George at the top of the outer frame. The Confraternity was abolished in 1711, when Philip V abrogated the local laws and institutions of the kingdom and city of Valencia. The style of the artist who was probably a direct follower of Marçal de Sas, if not Marçal himself, suggested the influence of early 15th-century Franco-Flemish artists such as Jacques Coene (act. 1398-1404), sometimes identified as the Boucicaut Master (documented 1402). The altarpiece depicts the legend of the Christian warrior and martyr St George, said to have been born in Capaddocia, Asia Minor and to have died at Lydda in Palestine about the end of the 3rd century. He is venerated as the patron saint of several cities and countries in Europe including Venice and England. St George appears to be the patron saint of Catalonia from the very beginning while the region was taking shape. The cult of this saint spread with the conquest of new territories by the Counts of Barcelona in the 13th century. The city of Valencia however devoted a cult to St Vincent Ferrer. The legend of St George is narrated in Jacobus of Voragine's Golden Legend (13th century) but also with variations in several apocryphal texts. In the present case, it seems that the artist followed a 14th century Catalan version (see R. D'Alos-Moner, Sant Jordi Patro de Catalunya, Barcelona, 1926, pp. 16-61), in which appear additional torture scenes here illustrated . -	As a saint warrior St George is dub a knight by the Virgin and exhibits his main attribute, the red cross. -	The princess of Silene is chosen as the next sacrifice. The larger panel in the lower centre shows the rescue of the Princess while the last panel of the upper register on the right illustrates the subduing of the dragon led into the city in order to be put to death there. The dragon is traditionally considered a symbol of evil struck down by the saint warrior, which illustrates therefore the struggle between good and evil. The saint then baptised the King and the people of Silene (far left of the middle register). A few examples of narrative cycles dedicated to St George have survived such as in the Oratory of St George, Padua, and an altarpiece now in the Wallraf-Richartz-Museum, Cologne, but scenes illustrating the martyr of the saint, described in the lower half of the altarpiece, are fairly rare and occur principally in churches or institutions of which he is the patron. -	St George is eventually beheaded. The central panel illustrating the defeat of the Moors against the Christian army led by James I of Aragon (1213-1276) at the battle of El Puig in 1237 does not belong to the story of St George but illustrates an important episode in the formation of Catalonia. Legend has it that the victory was due to the providential help of the Saint who appeared to James I while fighting the Moors. A parallel between the two superimposed central panels is therefore evident: St George striking the devil is implicitly associated with James I striking the Moors and commonly called 'Infidels' as they did not share the same religious faith as the Christians. J. Berg Sobré points out that the Islamic force is depicted as a bunch of ugly warriors, consistent with the militant anti-Muslim sentiment during the re-conquest of Spain. The retable illustrates thus the victory of Christian faith over the devil and the Muslims to which they are implicitly identified. The retable is therefore dominated by the Christian hierarchy, which frames the legend of St George in the upper and lower sections while full-length figures of saints and prophets divide each scenes. In the upper registers are indeed represented the Holy Spirit, followed by Christ holding the Orb underneath, flanked by the two prophets Moses and Elijah. Immediately below, the first of the central panels from the top is the Virgin nursing the Child crowned by Christ and surrounded by angels. On each side are represented the four evangelists (from left to right): St John, St Luke, St Mark and St Matthew. In the lower section, the predella below comprises 10 scenes of the Passion (from left to right): Agony in the Garden, Betrayal, Christ before Caiaphas, Flagellation, Mocking of Christ, Christ bearing the Cross, Crucifixion, Deposition, Entombment and Resurrection. 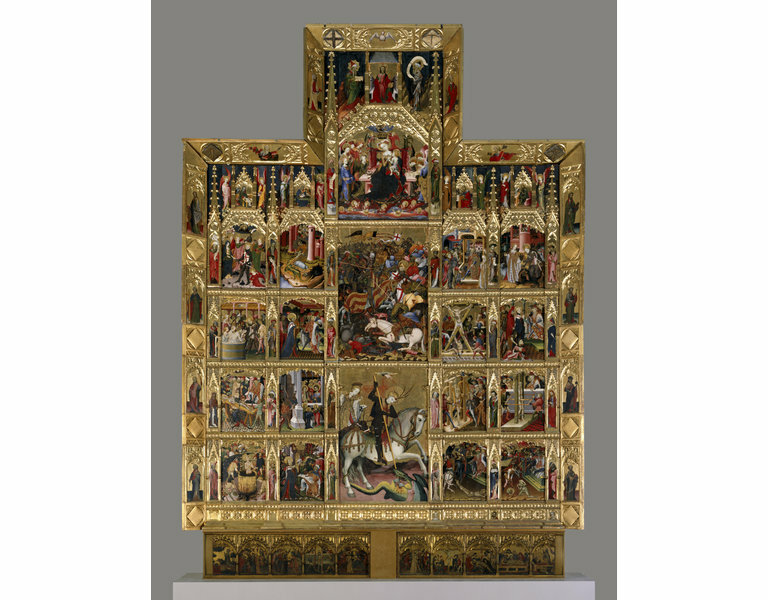 According to J. Berg Sobré, the altarpiece of St George is a typical example of the Valencian retable format of around 1400, in which the large proportions of the various components appear as a predominant feature. In this respect, some of the impact of the individual paintings is lost on the spectator. The altarpiece of St George appears as a fine example of the 'International Gothic Style' which combine medieval and early Renaissance elements. For instance the extensive use of gilt and ornamental plaster shaping decorative elements such as mullions, friezes, and canopies, of which consists the almost entire background, look still medieval in style whereas the painted architectural features and the thrones are reminiscent of models from the Italian and Flemish early Renaissance. Typical of the International Gothic is also the new attention to realism and nature, especially in the representation of plants and animals. The violent expression and twisted pose of the figures as well as the realism of the torture scenes pervaded with horrific details are particularly striking. Analogously the palette appeared richer and more varied than that of the preceding Romanesque period, including vermilion, cadmium, violet, green, lilac, ochre, white, grey, and yellow. Hence their sumptuous appearance and curious combination of realistic details and unworldly idealism. In Italy, the altar became a primary setting for painting on panel - hence the appellation 'altarpiece' - a format developed in Western art from the example of Byzantine icons. 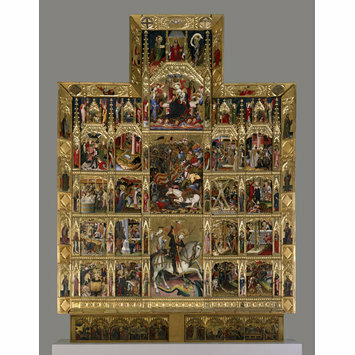 An early format consisted in gabled vertical panels representing a full-length saint flanked by scenes of his or her life and soon developed to include several individual compartments to form a polyptych which frames could become increasingly elaborate. They eventually transformed the altarpiece into an architectonic structure resembling in detail and spatial principles the façades of contemporary full-scale Gothic architecture. In Italy such altarpieces were usually made of wood and painted, while in northern Europe they were commonly executed in stone. A new type of altarpiece soon appeared in 15th-century Italy, known as pala,, and was closer to a framed picture. In the interest of clarity and unity, numerous medieval screens separating the choir and high altar from the nave were removed. The religious reforms of the 16th century brought new attention and some important changes to the form and function of the altarpiece. Under Protestant auspices, the altarpiece iconography was restricted to subjects well-suited to the sacrament celebrated at the altar, such as the Last Supper while the dynamic qualities that characterize Baroque art brought important changes to altarpiece design. Important altarpieces consisting of a single painting or relief continued to be made, but increasingly architecture was used as the theatrical setting for the three-dimensional display of the altarpiece's subject in sculpture. Altarpieces adorned both high altars and side altars. High altars often carried large altarpieces with elaborate programmes while side altars served a more private piety and their altarpieces were often endowed by private individuals. C.M. Kauffmann,Catalogue of Foreign Paintings, I. Before 1800. London: Victoria and Albert Museum, 1973, pp. 180-84, cat. no. 221. A. L. Mayer, Geschichte der Spanischen Malerei, 1922, p. 35 ff., repr. E. Tormo, Levante - Guias Calpe, Madrid: 1923, p. cxxxiii f.
C. R. Post, A history of Spanish painting, iii, 1930, p. 58 ff., figs. 269-71. L. de Saralegui in Archivo de Arte Valenciano, xix, 1933, p. 36 ff., fig. 1. L. de Saralegui in Archivo de Arte Valenciano, xxii, 1936, pp. 32-9, fig. 40 f.
J. G. Mann, 'Notes on the armour worn in Spain .. .' in Archaeologia, lxxxiii, 1933, p. 293, pl. 83. A. Marguillier, Saint Georges, L' Art et les Saints, Paris, n.d., repr. pp. 49, 51. J. Gudiol Ricart, Ars hispania, ix; pintura gotica,Madrid, 1955, p. 143 f., fig. 109 f.
M. de Riquer, L' arnès del cavaller, armes i armadures catalanes medievals, Barcelona, 1968, p. 112, figs. 162, 165. C. M. Kauffmann, 'The Altar-piece of St. George from Valencia' in V. & A. Museum, Yearbook, ii, 1970, pp. 65-100. B. Myers, St George and the dragon, unpublished dissertation, New York University, 1933. M. Heriard Dubreuil, Valencia y el Gotico Internacional, 2 vol., Valencia: 1987, pp. 60, 86, 122-123, 146, fig. 138, 409. J. Berg Sobré, Behind the altar table: the development of the painted retable in Spain, 1350-1500, Columbia:1989, pp. 111-113, 173, 209-211, fig. 64. A. U. Koch, 'Martin Schongauer, Uberraschende Entdeckungen uber seinen Reiseweg in Spanien' in Weltkunst Oct. 1994, pp.2696-98, fig. 3. Miquel Juan, Matilde, 'El Gótico Internacional en la ciudad de Valencia. El retablo de san Jorge del Centenar de la Ploma' in Goya, 336 (2011), pp. 191-213.